When she was chosen to compete in the Selection, America never dreamed she would find herself anywhere close to the crown–or to Prince Maxon’s heart. But as the end of the competition approaches, and the threats outside the palace walls grow more vicious, America realizes just how much she stands to lose–and how hard she’ll have to fight for the future she wants. 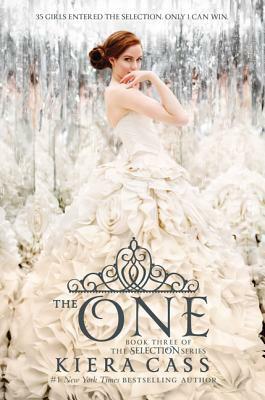 I always love THE SELECTION covers, they felt so princess-y with their beautiful ball gowns and their background. But out of all three of them, this one is definitely my favorite. The only thing I have qualms about the covers is how the title spoils the story for us. In The Selection, America entered the selection. The Elite, America is still competing as an Elite. The One? Well you guess it yourself. Now, this book. I really like this book. But I kind of hating america in this book. She’s using Aspen as a safety net and that’s so selfish. But in the end, I’m glad everything work out just fine even after Maxon found out about Aspen. She killed her. Kiera Cass killed Celeste in one short paragraph which contains only one sectence. What’s the point of showing the real Celeste and then kill her??? Queen Amberly and King Clarkson. I see that Clarkson has to be killed so Maxon could be a king. But I rather have him survived, Maxon explains everything to him, and watch him trying to control Maxon (but ofc he can’t anymore) As for Queen Amberly, I feel really bad for her. She almost got her daughter. So close. She’s been the nicest person in the palace, the one who accepts the girls and guide them through the selection process. She’s gone now. Who’s going to give America advice about being a queen when she need it? Next PostNext A Fresh Start!